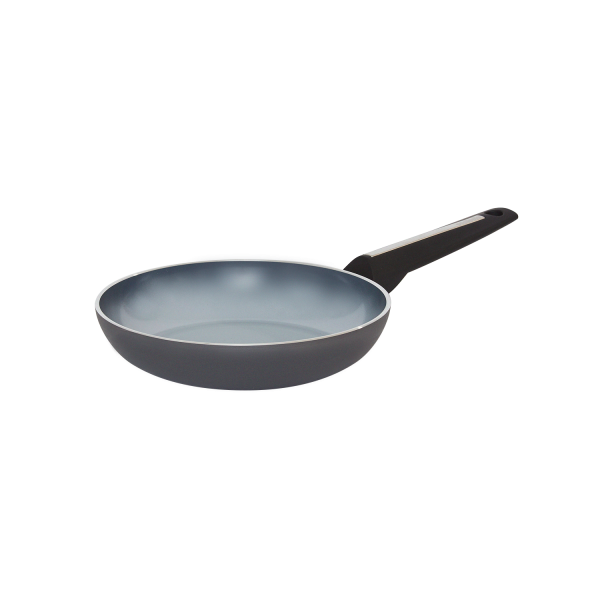 The Essteele Per Moda 24cm Open French Skillet features our unique BarrierSHIELD™ TECHNOLOGY — a proprietary heat-sealed barrier encasing the solid aluminium core that ensures maximum durability and a tried and tested tough surface for longlasting performance. The thickness of the natural ceramic is unlike any other in the market — with a glass hardened surface able to withstand high heat cooking with unprecedented food release and high abrasion resistance. Essteele Per Moda 24cm Open French Skillet is rated 5.0 out of 5 by 2. Rated 5 out of 5 by Fitzy from Fabulous Product We purchased this frypan about a year ago. At first we were a bit concerned about the ceramic surface scratching or staining. However, after a year of really heavy use, it's still going really strong. We only use on low-medium heat, which is all you need because the heat distribution is so good that it heats really evenly and efficiently so you really don't neet a higher flame. Between that and washing only with a non-abrasive sponge it's remaining in mint condition and given great service. We ordered online and the product was delivered the next day, so really couldn't be happier. If you care for this pan, it will give you great service.